Five funky Christmas trees and two text stamps make up this set. The Christmas trees are in two separate stamps with a group of three and a group of two. 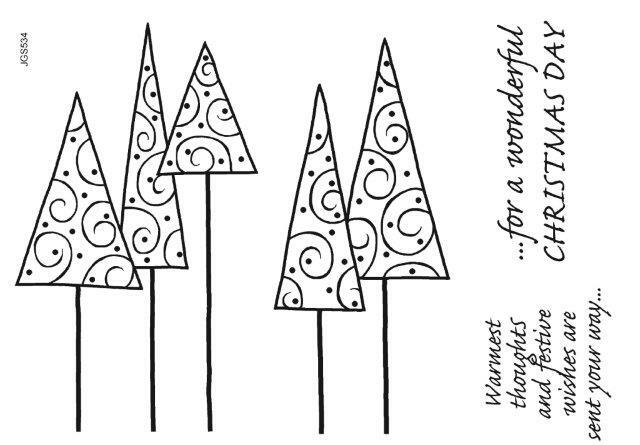 These stylish triangular Christmas trees on long thin trunks will add a modern twist to your Chirstmas cards and gift tags. The text stamps can be used together or singly on the inside or front of your cards making it a very versatile set. The tree stamps measure approx 5 x 9cm and 4 x 9cm (2 x 3.5 and 1.6 x 3.5 inches).